Cloves are the unopened, aromatic pink flower buds of the evergreen clove tree. They are mostly used in the cuisine of Asian, African and Middle East, lending flavor to meats, curries, and marinades.Also Cloves are used to give aromatic and flavor qualities to hot refreshments, frequently combined with other ingredients such as lemon and sugar. The essential oil extracted from Cloves is used in Indian Ayurvedic medicine, Chinese medicine and dentistry. 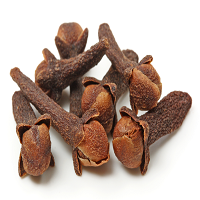 Cloves are adulterated with cloves stems, mother cloves, dust, dirt, stones and pieces of wood. It is sometimes adulterated with addition of clove terpenes, as an aid to digestion and for antiseptic and antibiotic properties in toothache.